May 8, 2018 advertising, Artificial Intelligence, Augmented Reality, social media marketing#wsjfuturefest, AI, apple, Baidu, cybersecurity, darktrace, Facebook, Google, kasparov, Machinelearning, marketing, NYU Stern School, Primer, TencentRandi Priluck, Ph.D.
Today I attended the #wsjfuturefest at Spring Studios in Tribeca. The session covered all things AI and included discussions from a number of NYU faculty members and AI experts. AI is not the scary big brother that some believe, rather right now it is a pretty limited tool. It’s great when there is a tremendous amount of data to show a particular specific thing, but doesn’t work the minute it gets complicated. We want a Rosie from the Jetsons and instead get Roomba, which doesn’t seem to know when it is spreading poop all over the house. AI can do recognition tasks and classification. Specifically, we already have speech image and natural language recognition. AI can play board games and do advertising targeting. It is not good with small data problems. If we want better AI, we should start studying small people. They are good problem solvers. Right now particular firms are largely responsible for AI. They are Baidu, Tencent & Alibaba from China and the US entities of Amazon, Google, Microsoft, IBM, Facebook and Apple. Whereas the US is great at algorithms and hardware, we are not as proficient as the Chinese in data – and they have much much more of it given their government and huge population. They will eat our lunch in tech in the future. China is fast building as the US is retreating. Their more advanced systems are now being used to control people. For example, China has a social ranking system of points that can be used to put people on a no fly list or no school entry designation based on their behavior that is continuously monitored. What will the future look like? It looks like the end of smartphones as we move to personal systems with interaction via voice. We should think of ourselves as data or oil as data are the new oil. We will have less autonomy and control of our information with an increasing number of devices. Most panelists agreed that we have little security, but few supported the GDPR. There was concern both about regulation and lack of regulation. The CEO of Darktrace talked about cyber security and how certain bad actors seek to invade networks. For example, there was an Internet attack on cappuccino makers in train stations connected to the train network. Another entity used the fish tank at a particular casino to obtain network entry through the automated thermostat system. AI uses generative adversarial networks, which are two neural nets competing against each other. There is a generator and discriminator from two networks that work together to solve the problem. However, there are means of protection. Specifically, AI can also be used to detect attacks. One method involves a data set of all prior attacks that is used to categorize and predict future attacks with supervised machine learning. Also, self learning of unsupervised data can find new threats modeled after human body immune response. In the casino fish tank with internet connected thermostat, the system looked for the key term “high rollers.” The internal controls found the thermostat using too much data and shut it down. AI can be used to video potential employees during hiring to record each movement and tick of a person. The goal would be to match the patterns to the people who are already in the organization and performing well to reduce turnover and poor performance. March 6, 2018 advertising, Augmented Reality, social media marketingRandi Priluck, Ph.D.
Last week I attended an interesting session at the Mobile Marketing Summit on augmented reality. Some common use cases are finding restaurants around town, foreign language translation and locating bathrooms near you. The key required technology is simply a mobile phone or smart glasses and game and AR engines. AR adds data to the real world captured thru a camera and analyzed. 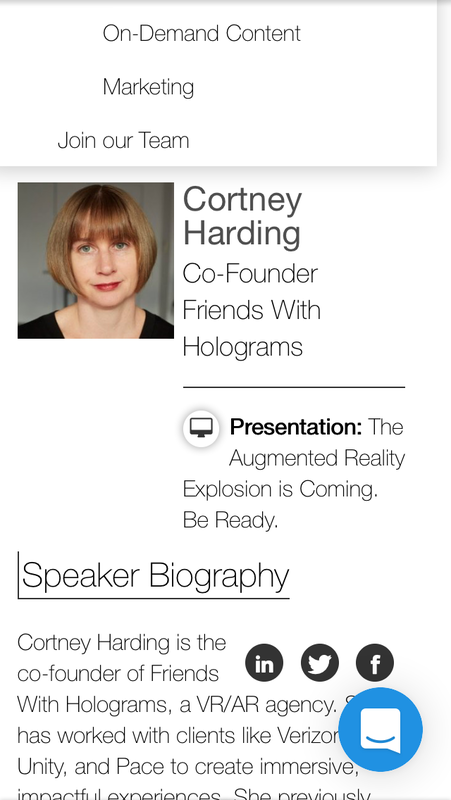 Soon AR will be available for delivery through a mobile browser with technology from Friends with Holograms. AR makes the real world interactive and takes it from limited spaces to any space such as a floor, wall or chair and offers interaction that users want. You can gamify or add information to the world. For example, maps are flat and hard to read, but an AR map is edited into the world on a three-dimensional plane that is easier to navigate. Though not at scale for customers, smart glasses adoption in the industrial realm is growing. There are industrial use cases that are economical in a way that’s not true for consumers. Let customers answer their own questions. Sales reps who are stuck repeating answers to familiar questions rather than selling can be freed with AR. Marketers can use AR to make it fun for customers to get answers themselves. AR could help people scan items and get information from a hologram or determine if two items go together, such as a charger and a phone. It could be used to hover a phone over a particular place to win a prize. Marketers could drive audience response with an interactive game. For example, hiding a mascot in locations and get people exploring and then ending in a desired place. It’s a scavenger hunt and people really find it fun. It also gets people out and about and moving in the real world. How can AR reduce post purchase friction? One big problem for appliance sellers is when the couch arrives at the apartment building or hose and it doesn’t fit. An Appliance seller could use AR to determine if the unit fits in all places for delivery. Now, you have to leave a website to download an app in the store. In the future developers will add a plug in for browsers to use the AR engine to engage camera and track surfaces through a web browser. AR is more practical than VR, which requires more information. To be ready for the growth of AR, it helps to have a library of digital assets that can be used to represent various elements of the brand experience. January 31, 2018 advertising, branding, case studies, cost per thousand, marketing, mobile marketing, social media marketing#P&G #socialmediamarketing #gopro #kingvideoRandi Priluck, Ph.D. These slides accompany Social Media & Mobile Marketing Strategy from Oxford University Press. 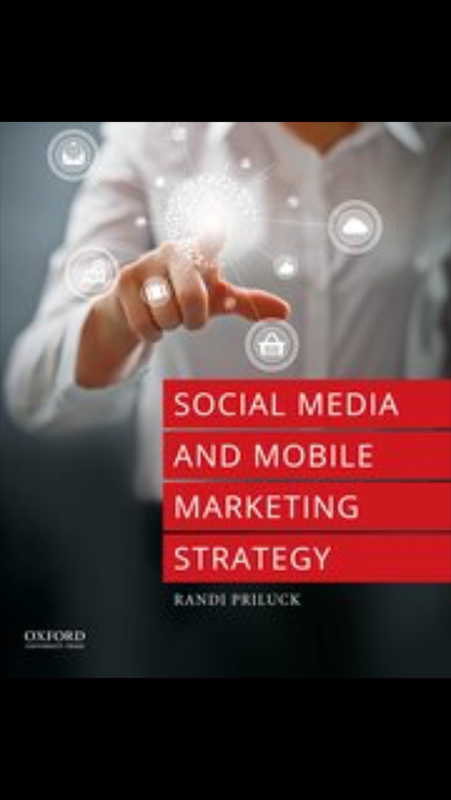 November 14, 2017 advertising, branding, case studies, content marketing, social media marketing, social media teaching resource, social media videosRandi Priluck, Ph.D. These slides focus on the social media marketing strategy planning process with an emphasis on content marketing. Did you know that there is a process to optimize the content you publish? You want to understand your customers, examine your competitors, develop thoughtful strong content and leverage that content across your channels. Great content can establish your expertise, engage your clients and operate as a data collection tool. People will give you email addresses to get your content. Once you have their email addresses you can access Facebook Look Alike audiences and really find the people with whom you want to interact. Generally speaking a good content marketing strategy and plan can boost your sales leads and improve the bottom line. Embedded in this presentation are videos with case studies and the results of a recent Content Marketing Institute study of B2B and B2C content strategies. Click on the link here for the SLIDES from Slideshare. These slides accompany Social Media & Mobile Marketing Strategy by Randi Priluck from Oxford University Press. These are a social media teaching resource for faculty looking to add digital media to the classroom. November 7, 2017 advertising, branding, mobile marketing, social media, social media marketingadvertising, marketing, Mobile, SEO, social mediaRandi Priluck, Ph.D. This set of slides helps professors teach an important aspect of social media marketing. Specifically, the important prerequisites that must be satisfied prior to planning for social media marketing. This social media marketing teaching resource covers digital marketing, search engine marketing, search engine optimization, email marketing, website design and mobile first design. Marketers must have a strong product offering, a plan for customer service and crisis management along with a website that drive the desired response. The slides contain videos and case studies related to digital marketing and media. These slides accompany Social Media and Mobile Marketing Strategy from Oxford University press. October 24, 2017 advertising, cost per impression, marketing, social media marketing#tenement museum #keyword research tools #seo #semRandi Priluck, Ph.D. Showing students the available tools to teach them how to use data to make decisions about marketing strategy is a key to effective teaching in social media. Since digital media are an essential part of a social media marketing strategy, students must understand search engine marketing and search engine optimization techniques. This social media marketing exercise introduces students to two tools: Spyfu and SEMRush. Both take data from Googel Keyword Planner and display the information in a more user friendly manner. It is also easier to log-into these sites. The limitation is that they do not provide as much data per search. This exercise goes well with either chapter three or seven in Social Media & Mobile Marketing Strategy from Oxford University Press. You are the marketing director for the Lower East Side Tenement Museum. The museum would like to attract visitors to New York City. The target market is tourists who are looking for historical and interesting activities in the city. Your job is to identify the optimal key words that tourists type into Google’s search engine so that you can determine the content you should include in your website and the terms you would use for paid search advertising. The Lower East Side Tenement Museum, located at 97 and 103 Orchard Street in the Lower East Side neighborhood of Manhattan, New York City, is a National Historic Site. The five-story brick tenement building at 97 Orchard was home to an estimated 7,000 people, from over 20 nations, between 1863 and 1935. The museum, which includes a visitors’ center down the block, promotes tolerance and historical perspective on the immigrant experience. Brainstorm a set of key words that you think people might type into Google for this search. Begin typing these words into the search engine and identify 3 long-tail key words using the Google search box. The options will appear as you search. Use Spyfu and the URL tenement.org. Click on Keyword Groups to identify many key words and the value of each. Consider the cost, the search volume, the keyword difficulty and the logic of the word/phrase itself. Determine the best key word to emphasize in your strategy given that the museum wants to maximize reach at the lowest possible cost. Explain your result. How does the options given by Spyfu compare to the words you brainstormed? Explain. Type the best keyword from #2 that you determined into SEMrush. How does your keyword compare to those recommended by Spyfu? Which tool is better? Spyfu or SEMRush? October 10, 2017 advertising, branding, social media marketingNASCAR Nutella #socialmediamarketing #socialmedia teaching resources, talkwalkerRandi Priluck, Ph.D. This week I uploaded a set of slides that cover research for social media marketing strategies. The topic focuses on social media listening, the challenges in measuring sentiment online and the tools that marketers can use to evaluate their online communications. There are case studies embedded in the slides and videos featuring NASCAR’s social media listening center and examining Nutella’s online visual strategy with Talkwalker. The presentation also includes two exercises that professors can use in class with students or assign at home or in an online course. These slides are social media marketing teaching resources to accompany Social Media & Mobile Marketing Strategy from Oxford University Press. The text can be used in a stand-alone social media course or as part of a broader advertising class that includes digital media. September 12, 2017 advertising, mobile marketing, social media, social media marketing, YouTube#socialmedia #socialmediamarketing, #socialmediateaching, advertising, MobileRandi Priluck, Ph.D. I have been working on Powerpoint slides for my course Social Media & Mobile Marketing Strategy. Here is a link to a free Slideshare presentation that may help you with your first class teaching social media marketing. The emphasis is on 2017 trends and how social media have changed the world. These slides go with the textbook Social Media & Mobile Marketing Strategy by Randi Priluck from Oxford University Press.